Content Stadium is a software as a service platform and part of Socios Sports B.V. from Amsterdam, the Netherlands. Content Stadium (CS) empowers editorial teams in the sports industry to instantly create premium visuals and animations for social media, integrating realtime and historical statistics with just one click. Sports companies using CS, create more content than ever before, while saving time and money. The content is always on-brand and strengthens coverage during the realtime sporting moments. This leads to an increased reach and fan-engagement around their brand on social media. 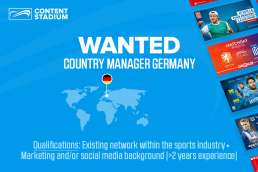 Following strong growth in the Netherlands, France and Belgium, we are now looking for a Country / Sales Manager Germany to become a key part of our continuous growth in the German, but also the Austrian and Swiss market (DACH).